11 Apr 2019 --- Marine plastic pollution costs the world billions of dollars per year. This is according to a study published in Marine Pollution Bulletin, which found that the 1 to 5 percent decline in marine ecosystem service delivery – the benefits humans receive from oceans – has equated to an annual loss of US$2.5 trillion for society. These costs – based on 2011 figures regarding levels of plastic in the ocean – are even likely to be an “underestimate,” claim the researchers. During the study, the researchers considered the different benefits that marine ecosystems bring to the planet, such as carbon storage, food for billions of people and waste detoxification. However, such benefits are threatened and can be diminished by the presence of marine plastics, which in turn can impact human wellbeing, owing to loss of food security, livelihoods, income and good health. The study sought to investigate the global, ecological and social impacts of marine plastic, providing “one of the first” holistic approaches to the problems, the researchers note. While research on plastic pollution has been growing exponentially over the past decade, there is a poor understanding of the holistic effects of marine plastic and the resultant impact on ecosystem services. In turn, this is bearing on human wellbeing, society and the economy, the researchers note. “We weren’t as shocked by the results as we had imagined – we knew the costs would be high. People don’t always realize the significant importance of the marine environment in supporting our day-to-day lives. It is the nature of the marine environment that it is often separate to humans, so it’s easy to forget that it is playing a daily role in regulating our climate and providing us with food and other resources,” Dr. Nicola Beaumont, Environmental Economist at Plymouth Marine Laboratory and study lead, tells PackagingInsights. 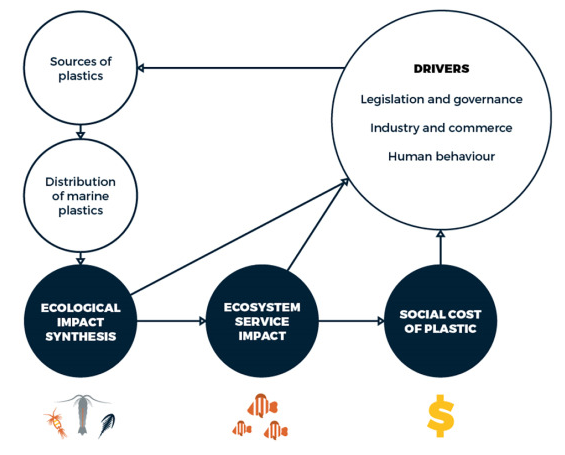 Click to EnlargeConceptual diagram describing the three-step approach used to assess the societal impacts of marine plastic pollution. How can we clean up the mess? The suggestion of a plastic tax has been floated, most recently in the UK. In October 2018, as part of the Budget speech, the UK government proposed a tax on plastic packaging that contains less than 30 percent recycled content. The new tax could come into force in April 2022, following a period of consultation on the detail and implementation timetable. Hard-hitting statistics have caught the imagination of the public and policymakers alike. 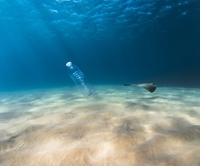 It is now believed, for example, that there are 5.25 trillion pieces of plastic debris in our oceans. Of that mass, 269,000 tons float on the surface, while some four billion plastic microfibers per square kilometer litter the deep sea, according to National Geographic data. Only last month, the European Parliament approved a ban on single-use plastics, with the core aim of reducing marine litter. Coming into force in 2021, the ban will disallow the use of the ten single-use plastic products that most commonly litter European beaches. It also contains provisions for Extended Producer Responsibility (EPR) schemes which ensure that the cost of waste management and litter clean-ups are covered collectively by the different operators. While a number of high-profile commitments and partnerships have come to the fore in a bid to combat marine plastic, these are also an integral part to the global waste problem, says Dr. Beaumont. “This is a global problem which needs a global solution – including individual actions, such as litter picks and making informed consumer choices, through to commercial and industrial commitments, improved waste management and recycling, as well as evidence-based policies,” she explains.